Overview - A small band of multicultural convicts stage a daring escape from a World War II-era Siberian gulag, and embark on a treacherous journey across five countries in a desperate race for freedom and survival. Adapted from author, Slavomir Rawicz's, gripping memoir The Long Walk: The True Story of a Trek to Freedom, writer/director Peter Weir's sweeping POW drama stars Jim Sturgess, Colin Farrell, Ed Harris, and Saoirse Ronan. The indomitable will of man is a thematic mainstay of storytelling. Present in all avenues, disciplines, and genres of art, the idea of humanity overcoming seemingly insurmountable odds thanks to pure fortitude of spirit is a tale as old as time. Cinema in particular loves these types of stories. There's something about the way a camera captures the anguish and pain, about the way an anamorphic lens can bring gravitas to the struggle, the way a montage can piece together a gradual build toward inspiration, and the way a powerful musical score can literally sweep the audience up in its hands when that last great moment of success arrives and our characters rise where it once seemed destined they'd fall. When done right, there is a kind of magic to it all, a true testament to the spectacle of film. Based on true events, 'The Way Back' is a prime example of this type of grand moviemaking, and thankfully, it's a rather fine example. Acclaimed director Peter Weir's first film since 2003's elegantly crafted 'Master and Commander: The Far Side of the World,' 'The Way Back' is an epic story of survival. No stranger to this sort of material, Weir brings a level of sophistication and expertise to the picture, holding it together where others may have faltered. The story follows a group of prisoners who escape from a Siberian gulag in 1940, and must then make their way through a harsh 4,500 mile journey across hostile landscapes toward freedom. With a cast headlined by Ed Harris, Jim Sturgess, Saoirse Ronan, and Colin Farrell, the acting is impressive across the board. Shot on location in the likes of Bulgaria, Morocco, and India, the lush and aggressive landscapes take on a cinematic life of their own, becoming characters themselves, just as important as their human companions. As the main conflict of man versus nature endures, survival becomes the group's desperate necessity and the lengths they go to, and the physical pain they endure on their journey are palpable. Though the world around them is their main enemy, Weir ultimately weaves a narrative where the true antagonist is the idea of defeat itself. All of these bigger thematic notions come together beautifully and form a universally relatable metaphor for survival that is held up by powerful images and authentic performances. Though the film is quite striking visually, there are some minor faults in the story's execution. Character development is a little thin, and while we see and experience the excruciating physical hardships they go through, at times we feel at a distance from their emotional struggle. Information about our core group is very gradually shared over the course of the film, through key bits of dialogue and small but important actions. This slow burn approach makes sense in the context of the story, but at times it can make it hard to connect. For much of the film it's difficult to really differentiate between some of the prisoners. At one point, it's even brought up in the story how little the escapees know about each other, which then leads to our first real insight into their pasts. Dialogue attempting to provide emotional back-story and development, though mostly successful, can at times come off as a bit too deliberate. These issues are rather small, and mostly subside as the film progresses. In fact, by the end, I was surprised how much I had grown to care about the characters. Though a little slim, the development is there and sort of sneaks into the story in both refreshingly subtle and occasionally overbearing ways. 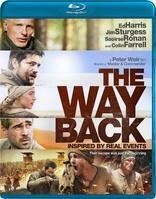 In the end, 'The Way Back' proves to be a nice addition to cinema's ever expanding pantheon of survival stories. It might not exactly stand with the best of them, or even with the best of Weir's work, but it's certainly a worthy effort from the director. At times it may be hard to connect with some of the characters, but this becomes less of an issue as the film goes on. When at its best, a more visceral approach to development is on display. At one point, nearing the last stretch of the story, one character looks up at the other members of the group, and we catch a closeup view of their faces. What follows is a startling look at a gang of sun charred, frail, thin, and barely living men who scarcely resemble the characters we started off with. In one brief moment, the entire journey is summed up in their dried lips, their bleeding sores, the crevices in their hardened faces, and the exhaustion in their eyes, and we realize just how far they've come, and how far they still have to go. It's a powerful image that encapsulates the struggle of man and what we will potentially put up with for greater goals. Weir has made a film that demonstrates man's determination to keep going, to not give up, and to simply raise our heads, put one foot in front of the other, and keep walking, and walking, and walking. Presented with a 1080p/AVC MPEG-4 transfer in the 2.35:1 aspect ratio, the video here is quite impressive. Shot in various breathtaking locations, the transfer is packed with detail and many instances of great depth and dimensionality. From snow covered forests, to towering mountains, peaceful lakes, dry deserts, and everything in between, the amount of visual variety is handled with great care and technical proficiency. This carousel of scenic diversity lends itself to some pretty extraordinary cinematography, all wonderfully realized here in this transfer. Colors start out appropriately drab and murky in the early gulag scenes, and come to life as the characters journey out into the world, taking on a beautiful vibrancy in many shots. There is a thin layer of natural grain present throughout that adds a nice authentic film quality to the otherwise pristine source. The only minor issues of note involve some early scenes set in the dark or at night. These scenes can sometimes exhibit black levels which appear a hair too light, contrast a bit too low, and an overall crushed appearance and lack of detail. This may be a result of how those scenes were shot, and not the transfer itself, but either way these are the weakest aspects of an otherwise gorgeous video presentation. Minor nitpicking aside, the video here is at times awe-inspiring, delivering the type of detail and depth one expects form the best of Blu-ray. From the weathered, stubbled faces of the prisoners, to the extraordinary wide shots of Bulgaria and Morocco, this transfer packs an impressive punch. Provided in an English DTS-HD Master Audio 5.1 track with English and Spanish subtitle options, the audio here is also very strong. Surround use is frequent and well utilized, coming off as natural and never out of place. An early scene in the gulag's mine is particularly impressive as the clanking and hissing of the mine breathes life into a fully realized soundscape that totally immerses the audience in the world of the film. Dynamic range is strong, with a wide gamut between sounds. Bass has some nice moments to shine, with a powerful blizzard and sandstorm providing the most bang. A lot of the dialogue is spoken in whispers, and occasionally the mixture of low talking with the actor's various accents can lead to a mumbled presentation, but thankfully most of the speech is crisp and audible. Balance is also well done, preserving the dynamic range while still allowing the dialogue room to breath. The director also knows how to utilize silence to great effect, evoking the isolation of the characters. At times only a few specific sounds of nature fill the speakers, providing a more subtle but deliberate sound design. As the film progresses the more robust aural presentation of its earlier sequences gives way to this more subdued approach, and while effective it doesn't quite hold the same impressive immersion. Overall the audio here is very well done. The only real issues stem from some occasionally muddled speech and an appropriate but less encompassing sound field in some scenes. Still, 'The Way Back' sounds quite good, with a sweeping score that soars at all the right moments. Unfortunately, there isn't a lot here. Just a trailer and one behind the scenes featurette in standard definition with stereo sound and no subtitle options. The Journey of the Journey (SD, 31 min) - An interesting behind the scenes look at the film's production. A nice amount of information is covered here, including some information on the film's real life historical setting, set construction, location selection, and the sometimes harsh and difficult elements the actors had to deal with. Overall, a welcome look into the making of the film, that is unfortunately too brief. 'The Way Back' is a well made examination of survival and the will of man. Though there are some minor shortcomings in the script, the visuals, acting, and direction weave a tale that earns its emotional ending. The video and audio presentation are very impressive, but the supplements are too slim. Still, definitely recommended.